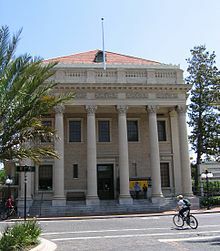 Gainesville is the county seat and largest city in Alachua County, Florida, and the principal city of the Gainesville, Florida Metropolitan Statistical Area (MSA). The population of Gainesville in the 2013 US Census was 127,488, a 2.4% growth from 2010. Gainesville is the largest city in the region of North Central Florida. In addition, it is also a component of the Gainesville-Lake City Combined Statistical Area, which had a 2013 population of 337,925. Gainesville is home to the University of Florida, the nation’s eighth largest university campus by enrollment, as well as to Santa Fe College. 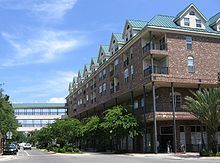 The Gainesville MSA was ranked as the #1 place to live in North America in the 2007 edition of Cities Ranked and Rated. Also in 2007, Gainesville was ranked as one of the “best places to live and play” in the United States by National Geographic Adventure. Circa 12,000 years ago Paleo-Indians lived in Florida, but fewer than 100 sites have been found. Although it is not known for certain whether any permanent settlements from that period were in the present city limits of Gainesville, archaeological evidence of human presence exists. With the end of the ice age to the north, sea levels rose so that coastal Florida became inundated and Florida’s land mass shrank while the southeastern United States became wetter than it had been, so the Paleo-Indians required fewer moves between water spots and more populous camps inhabited for longer periods of time emerged; among the spots where camps from this later period have been found is around Paynes Prairie very close to Gainesville. Eventually more complex social organization and agricultural practices emerged into what archaeologists classify as the Deptford culture(2500 − 100 BC). A Deptford culture campsite has been excavated beneath the subsequent Alachua culture “Law School Burial Mound” on the grounds of the University of Florida. Around the 1st century AD, Deptford people commenced moving into the environs of Gainesville to take advantage of wetlands in the environs of Paynes Prairie and northern Orange Lake, becoming the Cades Pond culture. Alachua culture villages budded off to form clusters connected by a series of forest trails, many of which are still in use as paved roads; among these clusters are some in the present city limits of Gainesville near the Devil’s Millhopper and near Moon Lake (the eastern shore of which is 0.4 miles (0.64 km) from the city limits[geo note 1]) as well as northwest of and north-central of Paynes Prairie, and west of Newnans Lake. The remaining Timucua were converted to Roman Catholicism and organized into missions overseen by Franciscan priests. The Mission San Francisco de Potano, the firstdoctrina (a mission with a resident priest) in Florida west of the St. Johns River, was founded in 1606 at the south edge of present-day San Felasco Hammock Preserve State Park. In or adjacent to present-day Gainesville were two other missions (each named for the saint’s day the first Mass was said in it), Santa Ana and San Miguel, which were south of and within a day’s walk from San Francisco, and are thought to be in the cluster east of Moon Lake where Spanish and Indian artifacts from the Mission-period have been found. The earliest missions were apparently established adjacent to native villages visited by De Soto’s expedition; Santa Ana is thought to be located where Utinamocharra lay, and in 1606 the friar who served as the priest was told of cruelties that the chief, when a boy, had suffered from De Soto’s men. Chief Potano‘s town was relocated in the colonial period to the vicinity of the Devil’s Millhopper, which is now inside the Gainesville city limits, from the western shore of Orange Lake. Spanish colonists began cattle ranching in the Paynes Prairie area using Timucua labor, and the largest hacienda (ranch) became known as La Chua (which combines the Spanish definite article La with the Timucuan word Chua, meaning “sinkhole“). Although La Chua was destroyed by the above-mentioned raiders from Carolina, the ranch nevertheless gave its name to the Alachua band of the Seminole tribe who settled in the region in the 18th century under the leadership of the great chief Ahaya the Cowkeeper. Gainesville was founded to place the Alachua County seat on the proposed route of the Florida Railroad Company’s line stretching from Cedar Key to Fernandina Beach. County residents decided to move the county seat from Newnansville (and chose the name Gainesville) in 1853, as the proposed railroad would bypass Newnansville. A site on Black Oak Ridge where the railroad was expected to cross it was selected in 1854. It is generally accepted that the new settlement was named for General Edmund P. Gaines,commander of U.S. Army troops in Florida early in the Second Seminole War. The railroad was completed from Fernandina to Gainesville in 1859, passing six blocks south of the courthouse. It is claimed that Gainesville was originally named Hogtown; however, Hogtown was actually an early 19th-century settlement in and around what is now Westside Park (in the northeast corner of the intersection of NW 8th Avenue and 34th Street) where a historical marker notes Hogtown’s location at that site. Hogtown is the eponymous village of the adjacent Hogtown Creek, which flows 5.7 miles (9.2 km) through Gainesville. Hogtown continued to exist until after Gainesville was founded, as evidenced on a map showing both towns, which was published in 1864 based on surveys from 1855. Two residents of Hogtown played a prominent role in establishing Gainesville. William Lewis, who owned a plantation in Hogtown, delivered 20 votes pledged to him to create a new town on the expected route of the railroad, in an attempt to have the new town named Lewisville. Tillman Ingram, who also owned a plantation and a sawmill in Hogtown, helped swing the vote to move the county seat to the new town by offering to build a new courthouse at a low price. Residents of Newnansville, disgruntled at losing the county seat, called the site chosen for the new town “Hog Wallow”, because of its location between Hogtown and Paynes Prairie. The former site of Hogtown was annexed by the City of Gainesville in 1961. In the 1850s secessionist sentiment was strong in Gainesville. Half of the white residents in Gainesville had been born in South Carolina(where secessionist sentiments were very strong), or had parents who had been born in that state. Aside from a few foreign-born residents, the other whites in town had also been born in Florida or other Southern states. Another factor was fear of blacks. Blacks, mostly slaves, were a majority of the population in Alachua County (although there were few in Gainesville itself). John Brown’s raid on Harpers Ferry in 1859 frightened the whites in Gainesville, leading them to organize a militia company called the Gainesville Minutemen. Fighting on a small scale reached Gainesville twice. On February 15, 1864, a small Union raiding party occupied Gainesville. Elements of the Second Florida Cavalry attempted to drive the Union force from the town but were defeated in a street battle. The raiding party was associated with a larger Union invasion of Florida that was defeated at the Battle of Olustee five days later. The Union troops did not seize or destroy any property on this raid, but did distribute food stores to the residents, who were suffering from shortages. Six months later, early in the morning of August 17, 1864, 265 Union troops and 15 “loyal Floridians” reached Gainesville. The troops stopped just east of town to prepare breakfast and care for their horses. A small home guard of 30 to 40 old men and boys attacked the Union camp, and were easily driven off. The Union troops then broke ranks and started looting the town. While the Union troops were scattered throughout the town a large number of Confederate troops were spotted approaching. The Union troops resisted the Confederate advance for an hour and a half, but were finally driven from Gainesville with heavy casualties. The first school for blacks in Gainesville, the Union Academy, was established in 1866 by the Freedmen’s Bureau to educate freed slaves. White residents of Gainesville were opposed to education for blacks and treated the teachers at the school badly, including incidents of boys throwing “missiles” into the classrooms. By 1898 the school served 500 students, and it continued in operation until 1929. White students had only private schools available before 1869, including the East Florida Seminary, which moved from Ocalain 1866 and merged with the Gainesville Academy (founded in 1856). Even after a public school system had been established in Alachua County, most white children who went to school did so at private schools, and the Union Academy was in session for a larger part of the year, and its teachers were better paid, than was the case for the public schools. Public education remained underfunded into the 1880s, classes having to meet in abandoned houses or rented rooms. The school year for public schools was as short as three months for some years. The first public school building was built in 1885. The Gainesville Graded and High School, with twelve classrooms and an auditorium, opened in 1900, and most of the private schools closed soon after. The county school board also provided some funds for upkeep of the Union Academy. The university opened with 136 students in the fall of 1906. For the first decade of the school’s existence it was in a rural setting, connected to downtown Gainesville by a single crushed rock road. The school had to close its gates at night to keep wandering cows out. Buildings at the university were originally built with state funds, but in 1919 the city contributed $1,000 for a new gymnasium to help bring the New York Giants to town for spring training. As the university grew, commercial establishments spread westward along University Avenue and new subdivisions were developed near the campus. The city experienced growing pains in the first decades of the century. The city’s only water supply had been Boulware Springs for many years, but the limits of its supply had been reached, and the city could no longer connect new subdivisions to city utilities. A bond issue was required to drill a well and build a water tower. A fire house was built in 1903, and the fire department was modernized, replacing its last horses with motorized equipment in 1913. However, the department remained a volunteer organization until the 1920s. Gainesville’s economy was still dominated by agriculture. Gainesville was a major shipping point for cotton until the industry was devastated by the boll weevil infestation in 1916-18, after which cotton was abandoned as a crop in the area. Truck farming had become important in north central Florida, with large shipments of vegetables and melons from Gainesville to markets in the northern US. Phosphate mining continued to be important, although starting to decline, and industries such as processing naval stores and making fertilizer thrived in Gainesville. World War I severely affected the economy in Gainesville. Markets in Europe, in particular Germany, were cut off by the war, and phosphate mining and the naval stores industry went into a slump, aggravated by the loss of cotton processing and shipping. Gainesville participated in the national economic boom that followed the end of World War I. In 1925, Gainesville was swept up by theland boom that had started in Miami Beach earlier in the year. New subdivisions were platted and auctioned, binders on property were sold and resold with ever increasing prices, and almost 100 real estate brokers and agents were registered in Gainesville on the first day licenses were required. Plans were floated to build a modern first-class hotel in Gainesville. After a false start in which the financing plans fell through, a developer from southern Florida who had become heavily involved in the real estate market in Gainesville, W. McKey Kelly, put forward plans for a ten-story, 120-room hotel. Construction on the Hotel Kelly, also known as the Dixie Hotel, started in 1926, but Kelly ran out of money before construction was completed, and the collapse of the land boom doomed the project. The unfinished hotel sat empty for more than a decade until a federal grant and private donation allowed its completion as the Seagle Building. The collapse of the land boom in 1925–1926 had not been as severe in Gainesville as in southern Florida, but did cool off the local economy. As a result, the Wall Street Crash of 1929 was not felt as strongly as in many other places. The city of Gainesville remained solvent throughout the Great Depression, and unemployment was lower than in most of the country. Agriculture continued to be a mainstay of the local economy. In 1922 tung trees were planted in Alachua County, and Gainesville became the center of tung oilproduction in the United States. Tung oil had previously been available only from China. Both tung oil and tung tree seeds were shipped around the world from Gainesville. The University of Florida, with about 1,000 employees and 2,000 students, helped stabilize the local economy during the Depression. In the middle and late 1930s various New Dealprograms brought money and employment to Gainesville. Utility lines were extended, streets paved and sidewalks installed. The Seagle Building was completed and occupied by the University of Florida. An airport, Gainesville’s first, was built. The end of World War II brought even more growth to Gainesville. The G.I. Bill allowed war veterans to attend college, and enrollment at the University of Florida boomed. More than half of the approximately 9,000 students at the university in 1946-47 were veterans. Many of the veterans had families, straining housing availability in the city. The university became co-educational in 1947, with the admission of over 800 women. The population of Gainesville doubled from 1940 to 1950, with construction and employment at the university becoming more important in the city’s economy. The city’s power plant was inadequate for demand. The federal government had required the city to buy electricity from private power companies rather than expand its own generating capacity during World War II. After the voters again rejected a proposal for the city to buy electric power wholesale, the city embarked on a major expansion of power generation. The water and sewer systems also were greatly expanded. The airport was returned to the city, and scheduled passenger flights started in 1950. The police department expanded from about 10 officers in the 1930s to 40 by 1950. Also in 1950, the old system of named streets was replaced by a quadrant system of numbered streets. The rapid growth of Gainesville put a strain on the public schools. When residents voted down proposals to issue bonds for school construction, the school board acquired surplus barracks from army bases to use as temporary classroom. The newer residents helped to pass school bond issues beginning in the 1950s. The return of veterans to Gainesville and the growth of the university also began to influence politics in Gainesville. In the 1930s, land ownership in and around Gainesville, and with it political power, had become concentrated in fewer hands. Veterans returning to the city after World War II had difficulty entering financial and political inner circles. University faculty and staff had been well integrated into the community before the war, but the growth after the war brought in many faculty who were dissatisfied with the political status quo in Gainesville.To avert tensions with local politicians, J. Hillis Miller, president of the university from 1947 to 1953, barred university faculty and staff from participating in local politics. During the 1960s, Gainesville became a center for college activism, and was described by then-professor Marshall Jones as “The Berkeley of the South“. The city was the center of the Gainesville Eight case in the 1970s, in which eight activists were accused of conspiracy to violently disrupt the 1972 Republican National Convention in Miami Beach. After their acquittal, activism declined, but rose again during the mid-1980s, as the University of Florida became the state’s focal point for anti-apartheid activism. The city gained notoriety in 2010 and 2011 after local church Dove World Outreach Center was involved in anti-sharia law campaigns, Quran burnings and the promotion of the “Innocence of Muslims” movie trailer. Gainesville is located at 29°39’55” North, 82°20’10” West (29.665245, −82.336097), which is roughly the same latitude as Houston, Texas. According to the United States Census Bureau, the city has a total area of 62.4 square miles (161.6 km2), of which 61.3 square miles (158.8 km2) is land and 1.1 square miles (2.8 km2) is water. The total area is 1.74% water. Gainesville’s tree canopy is both dense and species rich, including broadleaf evergreens, conifers, and deciduous species; the city has been recognized by the National Arbor Day Foundation every year since 1982 as a “Tree City, USA”. Gainesville’s climate is defined as humid subtropical (Köppen: Cfa). Due to its inland location, Gainesville experiences wide temperature fluctuation for Florida. During the hot season, roughly from May 15 to September 30, the city’s climate is similar to the rest of the state, with frequent afternoon thunderstorms and high humidity. Temperatures range from the low 70s (21–23 °C) at night to around 92 °F (33 °C) during the day on average. The all-time record high of 104 °F (40 °C) was reached on June 27, 1952. From November through March, however, the Gainesville area has a climate distinct from much of peninsular Florida with 16 nights of freezing or below temperatures and sustained freezes occurring every few years. The all-time record low of 6 °F (−14 °C) was reached on February 13, 1899, and the city experienced light snow and freezing rain on Christmas Eve, 1989. Traces of snow were also recorded in 1976, 1996 and again on December 26, 2010. The daily average temperature in January is 54.3 °F (12 °C). In average winters, Gainesville will see temperatures drop below 30 °F (−1 °C). As with the rest of the state, cold temperatures are almost always accompanied by clear skies and high pressure systems; snow is therefore rare. The city’s flora and fauna are also distinct from coastal regions of the state, and include many deciduous species, such as dogwood, maple, hickory and sweet gum, alongside palms, live oaks, and other evergreens. Thus, the city enjoys brief periods of fall color in late November and December (though hardly comparable to areas further north) and a noticeable and prolonged spring from mid February through early April. This is a generally pleasant period, as colorful blooms of azalea and redbud complement a cloudless blue sky, for this is also the period of the lowest precipitation and lowest humidity. The city averages 47.56 inches (1,210 mm) of rain per year. June thru September accounts for a majority of annual rainfall, while autumn and early winter is the driest period. The destruction of the city’s landmark Victorian courthouse in the 1960s, which some considered unnecessary, brought the idea of historic preservation to the attention of the community. The bland county building that replaced the grand courthouse became known to some locals as the “air conditioner”. Additional destruction of other historic buildings in the downtown followed. Only a small handful of older buildings are left, like the Hippodrome State Theatre, at one time a federal building. Revitalization of the city’s core has picked up, and many parking lots and underutilized buildings are being replaced with infill development and near-campus housing that blend in with existing historic structures. There is a proposal to rebuild a replica of the old courthouse on a parking lot one block from the original location. Additionally, the University of Florida Campus Historic District, consisting of eleven buildings, plus an additional fourteen contributing properties, lie within the boundaries of the city. Most of the buildings in the Campus Historic District are constructed in variations ofCollegiate Gothic architecture, which returned to prominence in the late 19th and early 20th centuries. Seagle Building (1926), downtown Gainesville’s tallest building. Numerous guides such as the 2004 book Cities Ranked and Rated: More than 400 Metropolitan Areas Evaluated in the U.S. and Canada have mentioned Gainesville’s low cost of living. The restaurants near the University of Florida also tend to be inexpensive. The property taxes are high to offset the cost of the university, as the university’s land is tax-exempt. However, the median home cost remains slightly below the national average, and Gainesville residents, like all Floridians, do not pay state income taxes. The city’s job market scored only 6 points out of a possible 100 in the Cities Ranked and Rated guide, as the downside to the low cost of living is an extremely weak local job market that is oversupplied with college-educated residents. The median income in Gainesville is slightly below the U.S. average. The city of Gainesville heavily promoted solar power by creating the first Feed-in Tariff (FIT) in the United States. The FIT allowed small businesses and homeowners to supply electricity into the municipal power grid and paid a premium for the clean, on-site generated solar electricity. The FIT started with a rate set at $0.32 per kilowatt-hour and would allow the person or business to enter into a 20-year contract where Gainesville Regional Utilities would purchase the power for 20 years. The FIT ended in 2013, when the rate was set at $0.18 per kWh, but the city is still seen as a leader in solar power. This increase in solar installations put Gainesville at number 5 in the world, in solar installed per-capita, beating Japan, France, China and all of the US. The sports drink Gatorade was invented in Gainesville in the 1960s as a means of refreshing the UF football team. UF still receives a share of the profits from the beverage. However, Gatorade’s headquarters are now located in Chicago. All of the Gainesville urban area is served by Alachua County Public Schools, which has some 75 different institutions in the county, most of which are in the Gainesville area. Gainesville is also home to the University of Florida and Santa Fe College. The University of Florida is a major financial boost to the community, and hundreds of thousands of dollars in additional revenues are created by the athletic events that occur at UF, including SEC football games. In all the University of Florida contributes nearly $9 billion annually to Florida’s economy and is responsible for more than 100,000 jobs. Other educational institutions include City College (Gainesville campus), Oak Hall School, and Saint Francis Catholic High School. Middle schools in the county run from 6th to 8th grades. High schools in Gainesville run from 9th to 12th grades. The Alachua County Library District provides public library service to a county-wide population (in 2013) of 253,451. The Library District has reciprocal borrowing agreements with the surrounding counties of Baker, Bradford, Clay, Columbia, Dixie, Gilchrist, Lafayette, Levy, Marion, Putnam, and Union. These agreements are designed to facilitate access to the most conveniently located library facility regardless of an individual’s county of residence. 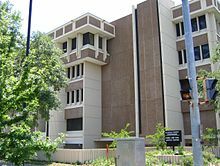 The Florida Department of Citrus has its department of economic research on the campus of the University of Florida. Gainesville has an extensive road system, which is served by Interstate 75, and several Florida State Routes, including State routes 20,24, and 26, among others. Gainesville is also served by US 441 and nearby US 301, which gives a direct route to Jacksonville, Ocala, and Orlando. The city’s streets lie on a grid system, with four quadrants (NW, NE, SW and SE). All streets are numbered, except for a few major thoroughfares, which are often named for the towns they lead to (such as Waldo Road (SR 24), Hawthorne Road (SR 20), Williston Road (SR 121), Archer Road (also SR 24) and Newberry Road (SR 26). Streets ending in the suffixes Avenue, Place, Road or Lane (often remembered by use of the acronym “APRiL”) run generally east-west, while all other streets run generally north-south. At one time, Gainesville had railroad lines extending in six directions from the community and was served by several depots, the earliest route constructed reaching the town in 1859. As traffic and business patterns changed, the less heavily used railroads were abandoned beginning in 1943, and some routes realigned, with the last trains running in the middle of Main Street in 1948. By the 1980s, the only freight operator into the city was the Seaboard System (formerly the Seaboard Coast Line Railroad, now merged intoCSX). Passenger service into Gainesville had ended by the time of Amtrak‘s 1971 creation. In 1984, the last freight trackage was removed as the Seaboard abandoned the branch through Gainesville to Hawthorne due to light customer traffic on the line. In addition to its extensive road network, Gainesville is also served by Gainesville Regional Transit System, or RTS, which is the fourth largest mass transit system in the state. The area is also served by Gainesville Regional Airport in the northeast part of the city, with daily service to Atlanta, Miami and Charlotte. The presence of a major university enhances the city’s opportunities for cultural lifestyles. The University of Florida College of the Arts is the umbrella college for the School of Music, School of Theatre and Dance, School of Art and Art History, and a number of other programs and centers including The University Galleries, the Center for World Art, and Digital Worlds. Collectively, the College offers many performance events and artist/lecture opportunities for students and the greater Gainesville community, the majority of which are offered at little or no cost. Since 1989, Gainesville has been home to Theatre Strike Force, the University of Florida‘s premier improv troupe. In addition Gainesville also plays host to several sketch comedy troupes and stand-up comedians. In April 2003, Gainesville became known as the “Healthiest Community in America” when it achieved the only “Gold Well City” award given by the Wellness Councils of America (WELCOA). Headed up by Gainesville Health & Fitness Centers, and with the support of Shands HealthCare and the Gainesville Area Chamber of Commerce, 21 businesses comprising 60 percent of the city’s workforce became involved in the “Gold Well City” effort. As of July 2011, Gainesville remained the only city in the country to reach the achievement. The National Coalition for the Homeless cited Gainesville as the 5th meanest city in the United States for the city’s criminalization of homelessness in the Coalition’s two most recent reports (in 2004 and 2009), the latter time for its meal limit ordinance. Gainesville has a number of ordinances that target the homeless, including an anti-panhandling measure and a measure making sleeping outdoors on public property illegal. In 2005, the Alachua Board of County Commissioners and the Gainesville City Commission responded by issuing a written “Ten Year Plan to End Homelessness”; which was followed by the 2010 “A Needs Assessment of Unsheltered Homeless Individuals In Gainesville, Florida” presentation to a joint meeting of Gainesville and Alachua County Commissions. An indoor homeless shelter was built on the site of the former Gainesville Correctional Institution grounds, with surrounding area designated for tents. Gainesville is renowned in the recreational drug culture for “Gainesville Green”, a particularly potent strain of marijuana. Orange and Blue magazine published a feature article in 2003 about the history of Gainesville Green and the local marijuana culture in general. In the mid-1990s, several Gainesville Hemp Festivals took place outside of theAlachua County courthouse. Gainesville is well known for its music scene and has spawned a number of bands and musicians, including Tom Petty and the Heartbreakers, Stephen Stills, Don Felder andBernie Leadon of The Eagles, The Motels, Against Me!, Less Than Jake, Hot Water Music, Loyal Revival, John Vanderslice, Sister Hazel, Hundred Waters, and For Squirrels. It is also currently the location of independent labels No Idea Records and Elestial Sound, and it is also the former home of Plan-It-X Records, which moved to Bloomington, Indiana. For two years, the Gainesville non-profit Harvest of Hope Foundation hosted the Harvest of Hope Festival in St. Augustine, Florida. Gainesville is also the home of www.FLAROCKS.com, the founders of ‘Santa Jam’ who hold concerts every December throughout North Florida as a toy fundraiser for sick, injured, and homeless children, as well as being a local musician showcase. Since 2011 they have distributed nearly 700 toys to hospitals, local churches & homeless charities, and to needy families across the area. Between 1987 and 1998, Gainesville had a very active rock music scene, with Hollywood star River Phoenix having the local club Hardback Cafe as his main base. Phoenix’s band Aleka’s Attic was a constant feature of the rock scene, among others. The Phoenix family is still a presence in Gainesville with Rain Phoenix‘s band Papercranes and Liberty Phoenix’s store, Indigo. Today, Gainesville is still known for its strong music community and was named “Best Place to Start a Band in the United States” by Blender magazine in March 2008. The article cited the large student population, cheap rent, and friendly venues as reasons. Gainesville’s reputation as an independent music mecca can be traced back to 1984 when a local music video station was brought on the air. The station was called TV-69, broadcast on UHF 69 and was owned by Cozzin Communications. The channel drew considerable media attention thanks to its promotion by famous comedian Bill Cosby, who was part-owner of that station when it started. TV-69 featured many videos by punk and indie-label bands and had several locally produced videos (“Clone Love” by a local parody band, and a Dinosaur Jr. song). The Florida Gators is the varsity team of the University of Florida, and competes at the Southeastern Conference of the National Collegiate Athletic Association since 1933. It has been ranked in the top 10 in the NACDA ranking since the 1983–84 season. it has won 32 national team championships, including two men’s basketball titles, three football titles, four men’s golf titles, and six women’s tennis titles. Gainesville is served by The Gainesville Sun and The Independent Florida Alligator, the student newspaper for the University of Florida and Santa Fe College. The New York Times Editing Center also resides in Gainesville. Arbitron ranks the Gainesville-Ocala market as the nation’s 83rd-largest. Thirteen radio stations are licensed to operate in the city of Gainesville—five AM stations, six commercial FM stations, and two low-power non-commercial FM stations. Three of the stations (WRUF, WRUF-FM, and WUFT-FM) are operated by broadcasting students at the University of Florida. WUFT-FM is the city’s NPR member station, while the WRUF stations are operated as commercial stations. Gainesville is the 162nd-largest television market in the nation, as measured by Nielsen Media Research. Broadcast television stations in the Gainesville market includeWCJB, an ABC/CW affiliate in Gainesville; WGFL, a CBS affiliate broadcasting from High Springs; WNBW, a NBC affiliate in Gainesville; WOGX, a Fox owned-and-operated station from Ocala; WMYG-LP, an analog MyNetworkTV affiliate broadcasting from Lake City; and WUFT, the PBS station affiliated with the University of Florida in Gainesville. WOGX bears the distinction of being the smallest network O&O in the United States, as a semi-satellite of another Fox O&O, WOFL in Orlando.